Can Poor Collagen Increase Your Risk of Developing Varicose Veins? Collagen is the connective tissue that adds structural support to your body by binding or holding parts together. Collagen is actually a protein and accounts for over a quarter of all the protein in your body. It is found in your tendons, joints, ligaments, and even your bones, blood, and eyes. More importantly for our purposes, collagen is responsible for maintaining the elasticity and strength of your blood vessels and skin. Can Crossing Your Legs Lead to Varicose Veins? Common Varicose Vein Myths. Can Crossing Your Legs Lead to Varicose Veins? While you may have heard a few reasons, whether medically or in religious idioms, why you should not cross your legs, the fact remains that most of these are simply myths. One in particular is the common myth that crossing your legs will cause varicose veins. The truth is, that this is simply not true. Crossing you legs will not lead to varicose veins no matter how frequently or often you do so. While the circumstances are rare, there is a possibility that your varicose vein disease will progress to the point where the veins will actually bleed. Generally speaking, varicose veins are veins that no longer function properly and have resulting high blood pressure inside the veins. Intense Pulsed Light (IPL) Treatment vs Laser Vein Treatment when Treating Spider Veins? Intense Pulsed Light (IPL) treatment is a common treatment for spider veins, used as an alternative to more conventional treatment methods like laser vein treatment. The difference being in the actual use of the laser. For example, vein specialists generally use laser treatment to get rid of deeper veins by feeding the laser into the veins, but may also use laser to treat visible spider and reticular veins. Intense pulsed light (IPL) is another method of providing a very similar treatment but is only really used for surface veins (i.e. veins that are visible at the surface of the skin). Intense Pulsed Light treatment requires no downtime, and can be performed in an office setting with the non-invasive treatments lasting 15-45 minutes depending on the nature of the veins needing treatment. 1. What special training or certification do you have in vein care and where did you receive your training? When searching for someone to treat your varicose veins, one of the most important things you can do for yourself is to find someone who has demonstrated their commitment to the practice of Phlebology - the study, diagnosis, and treatment of vein disease - through their membership and board certification with the American College of Phlebology (now known as Venous and Lymphatic Medicine). 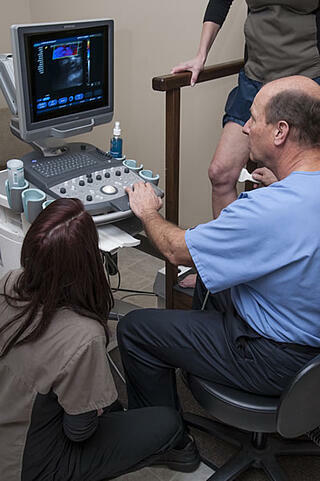 As a member of this society your varicose vein doctor will be held to the highest standards of venous care providing specialized training in both the treatment of venous and lymphatic disease and diagnostic ultrasound.